Blue Lake 274 is an all-time favorite bean that's nearly fiber-free, produces prolifically over a long season and has excellent flavor, fresh or frozen. A heavy producer over a long season, it's excellent fresh or frozen. Plants yield early and need no support. One 2 oz. seed pack will sow a row of about 20'. Our seed is not treated. Bean, Bush, Blue Lake 274 is rated 4.1 out of 5 by 15. Rated 5 out of 5 by AnnieMac from Excellent flavor, crunch, and long harvest period I've been trying out different bean varieties over the last few years, one had great taste but needed harvesting every two days and we were sick of beans by the third harvest. Another variety everything matured at the same time so it was one huge harvest, and the taste was awful, with no crunch at all. The Blue Lake beans are my go-to bean. I planted two 30-ft rows of these, the first harvest was huge, about a grocery bag full, and they weren't ready for a second harvest until a week later, where I got about a 1/4 bag full. There's still some flowering, so I know these are going to be producing for quite some time. It gives us a chance to actually WANT green beans again, and again, and again. Rated 5 out of 5 by mllake2 from easy to grow, nice yeild I bought the pound package last year, as these were the best variety we tried the previous year. I don't usually buy burpee seeds unless it is something unique locally, but buying the 1lb package has quite the value-especially when they are on sale. The produced plenty for the home, for the few people we know, also gave away about 50 lbs of fresh green beans to the homeless shelter. Very easy to grow, no fertilizers (nor inoculants) used, and pretty high yield-or at least I thought so. I don't follow the recommended planting and then thin to recommended space. Whatever the recommended space is is the distance between plants that I plant, and they have a high germination rate. Also planted them in double rows. I didn't harvest when they were tiny pods as I guess many people do, but when the pods were 6-9 inches. Caterpillars started finding them later in the year 8(, but that's life. They need to eat too, I guess. I should research what to grow to repel them. Purchased 2 lbs (and some other stuff) this year when they were BOGO , probably will only plant 1 lb again this year and plant the rest next year. Rated 5 out of 5 by Archer from Great Bean I bought one seed packet 3 years ago when starting my first raised bed garden. My garden is quite small and I practice the square foot method to try and get the maximum yield. I planted 16 Blue Lake Bush beans the first year; they produced enough for me to have regular stir fries and still keep some seeds over for the next year. I kept seeds and planted them last year and got the same results. 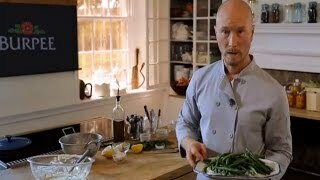 The beans are nice raw, boiled, or in a stir fry. They are very dependable and hardy, I'm in zone 7. Last year I was able to grow a summer and fall crop with the same results. I have continued saving the seeds and planted them again this year. I have high expectations, for these plants have been one of the easiest to maintain and reliable plants in my garden. The only issue I've had was caterpillars getting to some of the pods before I could harvest them. I bought the product one time and as long as I continue saving seeds, I shouldn't need to buy another bean again unless I just choose to try a different variety. Very satisfied. Rated 5 out of 5 by Southern Growgirl from Best green bean ever!! Best green beans I have ever grown! Plants are hearty, vigorous, and mostly bug free (good because I am chemical free). Plants produce very well, and beans are delicious raw or cooked! Freeze and can very well. Rated 1 out of 5 by kjmf from not good bought this plus several more vegetable seeds. I am very disappointed in the products. only seeds that grew was the spaghetti squash. the beans i think i got like half a pound or 1 pound which came to like 8 25 ft rows in my garden only half of 1 25 ft row grew. Rated 5 out of 5 by JohnnyBoy from Favorite I rotate these to different spots each year, and each year they continue to produce large quantities of a superb bean. Never disappointed in these. Rated 5 out of 5 by Dufus from Heavy Yields of Nice Beans This is my second year of growing snap beans and I have had excellent results with Blue Lake 274 bush beans. 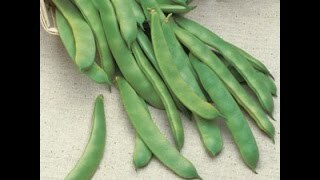 This variety of beans produces heavy yields as compared to other varieties grown in the same garden plot. Some reviews claim poor germination, this is from planting in cold soil (too early or wet soil). This is what works for me in heavy clay soil: Amend with compost, manure, bagged garden soil and other organic material. Water in some fish fertilizer, sea magic and worm castings before planting. At the first bloom, repeat a mild solution of fish fertilizer in the evening as a foliar and again at full bloom. I use 1-Tbs of fish fertilizer in a 2-gallon watering container to 15 feet of row... Keep in mind that too much nitrogen can hurt your been crop. My neighbor was watching me carry in several buckets full of green beans from a small garden. Rated 5 out of 5 by planterjeff from Good Bush Bean!! I am on my second year with these beans. I use these in a square foot garden and plant about 6-9 per square. They always produce decent yields. I get one large harvest from each plant. Taste good, no strings.